Heather didn't find Scottie Dad's trick too funny. Mr. K thought it was hilarious! Last night, Scottie Mom and Dad went out to dinner. Scottie Mom's a picky eater - nothing like Heather or Mr. K - so the fact they were trying a "new" restaurant was something of a big deal. They looked over the menu, made their selections and waited patiently for the food to come. When Scottie Dad's appetizer came (a plate full of oysters), he looked at Scottie Mom with a devilish grin and said, "If you eat one of those right now, I'll let you get TWO more Scotties." Scottie Mom dropped her fork. Was he serious? Is Scottie Dad trying to play a mean trick? Will he really adopt two more Scotties if she does this? What are the odds that when she tries these oysters for the first time, she'll be allergic (since, in reality, she's allergic to just about everything)? Who was she kidding? Two more Scotties would totally be worth it! Scottie Mom reached for an oyster, knowing this was not going to be a pleasant experience, but recognizing this was a once-in-a-lifetime opportunity that she could not pass up when suddenly, Scottie Dad says, "Oops! Time's up. You weren't quick enough. I said you had to eat one right now. You took too long." Scottie Mom was furious. She hadn't taken long to make up her mind. In fact, she probably spent less than a minute questioning Scottie Dad's intentions before deciding she'd get that Scottie (or two!) even if this was just a mean joke. She protested. Scottie Dad said, "Hey - there will be other opportunities." Scottie Mom wasn't so sure. She has been hounding Scottie Dad to let her rescue two more Scotties or, at the very least, become a Foster Scottie Mom. For years, Scottie Dad has refused. Scottie Mom has tried all sorts of bargaining techniques...what if Heather and Mr. K got more likes than Boo, the world's cutest dog, on Facebook? How about if Scottie Dad got that pool table he's always wanted...would a Scottie or two be allowed to come live at The Scottie House then? Sadly, the answer is always no but the hope that two more Scotties might find forever homes in The Scottie House with us has been revived. It's just a matter of time before Scottie Dad presents another challenge and it will be up to Scottie Mom to complete it in a timely manner, no questions asked so that two more lives can be saved (and Scottie Mom friends and fans can enjoy four times the silly Scottie stories and photos!). 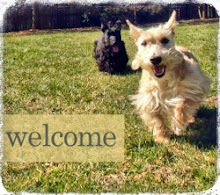 Tell us: what do you think is the trick to getting another Scottie? What kind of trick do you think Scottie Dad will pull next? Oysters, my Lee would not have given that a second thought. Lee loves oysters like she loves Scotties. I'm the only one in my family who likes oysters, my mom dislikes it totally. But for two scotties my mom would eat the oysters including the plate and the table. If time didn't run out you could have had two Scotties. It did, so you can have three. That was a mean trick. We think she should have at least got ONE more scottie! That's the fair thing. The "trick" is pretending to ask forgiveness after adopting however many Scotties you want! I think the "trick" will be Scottie mom wearing Scottie dad down until he caves. Oh no! Maybe Scottie Dad is making these challenges just so it won’t look like he caved when you do win! Wow we have no trouble with the oysters but we suspect Scottie Dad is harbouring secret thoughts of more Scotties already. Work on him good mum we think he will pretend to give you another challenge really soon. That was a mean tease! We were two dogs for seven years, then we got my little sister and three dogs really changes things. Now with lab cousin Lena staying with us for two weeks we are four dogs and that is just too much. It is fun for a short time but Mom says two, at most three is best for us. You guys are smaller, so that may make a difference too. Happy Sunday! 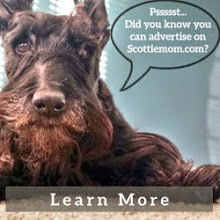 We think that Scottie Mom should just keep trying and trying...those Daddies almost always give in!! Sounds like scottie dad secret;y wants another scottie and won't be long before he gives the green light. just keep doing what you're doing scottie mum! Mean trick! No Scottie Dad! So next time he will have to double up (4 more Scotties), think you guys can handle more brothers and sisters? Do what I do. Just get them. What is he going to do, leave? If they make you happy that is whats most important. Your a great Scottie Mom. No one should be allowed to tell you, you cant do something that is dearest to your heart. If he loves Heather and Mr. K, he will love two more. Four running around in the house is Heaven. 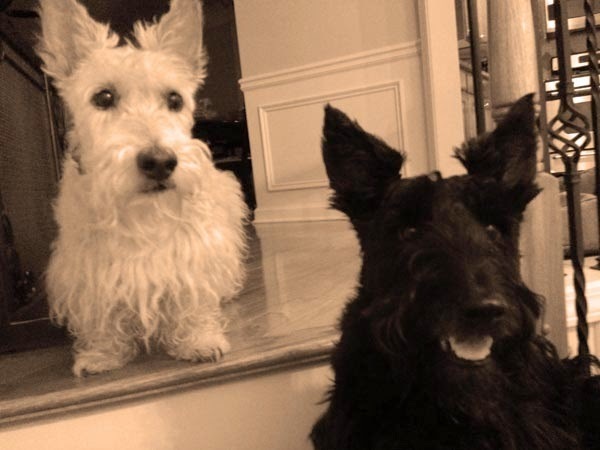 I lost my Scottie (Rowan) 7 years ago and our Westie (Alaisdair) 2 months ago. The house is empty without them. I am so very grateful for your site. It helps me to smile. What does he mean, "he'll LET you get 2 more Scotties" ... is he your dad? I'm all for making a list of pros & cons & talking it over.